Found this hole in the plate glass window of a church. 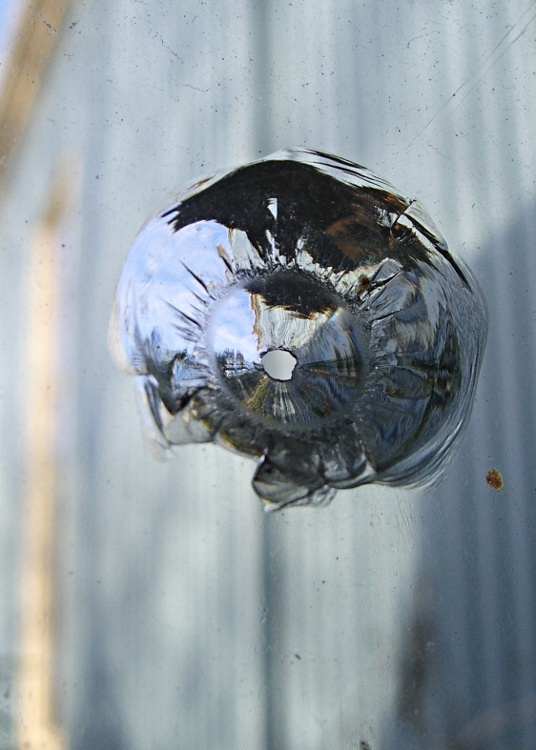 The conchoidal fracture pattern is characteristic of a bullet impact at more-or-less right angles to the pane. I suppose, based on the very small entry hole and no damage to the opposite wall, that it was something like a BB gun at close range, rather than a 0.22-cal handgun or rifle far away. Somehow, you just know the lunkheads doing this sort of thing have never repaired a window themselves… when you’re a constructor, you just don’t go around destroying things. But maybe that attitude marks me as a fuddy-duddy. This entry was posted on 2009-04-21, 07:56 and is filed under Oddities, Photography & Images. You can follow any responses to this entry through RSS 2.0. Both comments and pings are currently closed. The effective aimed range for airgun target shooting seems to be around 50 meters. The absolute max for a stray shot is maybe 350-ish, with essentially no energy remaining when it falls out of the sky. I tried shooting some scrap windows (I replaced a bunch a few years ago and what else do you do with the old ones?) with a 0.177 lead-pellet airgun at three meters and had the pellets simply flatten out and bounce off the panes: I never did mange to shatter a pane. Which means it was likely a hard BB, rather than a lead pellet, and close enough to be aimed deliberately. A pox on their backsides! i can see from the above image that the BB creates a divot in the glass. does it create a divot on the side from which the BB was being shot or opposite? The view in the picture is from inside, looking out. The cone is on the inside of the window, away from the impact: all the fragments (and, perhaps, the bullet) end up on the inside of the room. Although the cone exhibits those jewel-like crisp ridges, there are no acute angles to slice your fingers. On the outside there’s nothing but a small, smooth hole, flush with the glass surface. The hole has very sharp edges. Since the window is plate glass is reacts like flint when struck. The BB bounced off the glass and the cone chipped inward. Check out this book for more information. I didn’t realize the bullet / BB / projectile could bounce off, but it certainly makes sense. Hi – just wanted to throw something into the mix here as I have had 2 holes looking identical to those above appear overnight in my dinning room window. The interesting thing is, is that they are only in the pane glass of my double hung window and do not run through the storm window on the outside – there is also no shards of glass or anything else to see for that matter. So here’s the mystery. How did they get there and appear overnight? I’m 100% certain there was NO ONE shooting bb guns in my house overnight as I have a big dog that makes lots of noise. SO…… my current line of thought is that it is something to do with the heat/cold/humidity index in the house right now plus old windows in an old house. For example we’ve had no heat in 3 days (so its down to 52 degrees inside the house in the morning) and we have imperfections in the window panes. Can this create a stress point that would result in something similar? I’m actually watching a very small imperfection right now on one of the panes wondering whether it will turn into this “bullet-like” hole next. Any other ideas/suggestions of why my glass is acting up now would be very grateful! Visible imperfections in the glass would certainly cause internal stresses, but I have no idea how (or whether) such an imperfection could “pop out” to resemble a conchoidal fracture. In any event, you should be able to find the missing glass fragment(s) somewhere: between the windows if the large side faces outward, on the floor if it’s aimed inward. I’d take close-up pictures of any visible flaws to provide a reference when the next hole appears. Comparing the before-and-after pictures should be instructive. Let us know if you discover anything! we had the exact same thing happen to our window and are completly stumped! If there is any expanation to this please dont keep it to your self. I appears to be a bullet hole, yet smooth to the touch inside and outside. Very perplexing! Thanks for any suggestions. That’s the surprising part: the inside has a large conical crater and the outside is a perfectly flush hole. Not a sharp edge anywhere, even though you know broken glass must have razor-sharp corners. Of course, the glass fragments inside the room have sharp edges, but they may be small enough to vanish into the vacuum cleaner before you notice the hole in the window. We have also found a impact fracture in our living room window, almost identical to the one pictured above. A guy comes regularly to perform lawn maintenance in yard with assorted surfaces, from grass to gravel. I brought up the window damage and put forward my guess that it could have been caused by a small stone kicked up from the lawn mower. He, of course, denies that it could have been him since he would have noticed, or heard it. He wears ear protection while mowing, and I have mowed plenty of lawns in my time to know that you don’t always know what’s being spit out from under the mower. Do you think a small stone kicked out from a mower blade would have the same strike force as a BB pellet? The BB hypothesis holds no water, since someone would have to bust into the back yard and fire a BB at an odd place on the window. A long range shot is also out of the question since we have a high fence, large trees and nearby houses to prevent any accidental projectile from reaching the window. I can’t think of a convincing way to estimate that, because the impact energy depends on launch speed, stone weight, and impact angle. We know all of those to within an order of magnitude, but that’s not much help! I’m sure that’s what happened as well. I’m a renter, and the lawn maintenance guy is hired by the owners for that work. I just don’t know if they will try to find some way to blame me for it and seek financial restitution, or not. The gravel is of the small variety (up to 10mm) Do you happen to know the required impact energy to cause that type of window damage? (fracture site is less than 10mm and an estimated impact angle of roughly 15 degrees. Do you happen to know the required impact energy to cause that type of window damage? Haven’t a clue, so my estimates would be so imprecise as to be meaningless. FWIW, my Shop Assistant and I shot an old window (which I’d replaced with a new one earlier in the day) with a pellet gun at close range: the soft lead pellets just squashed flat against the glass! So it involves not just energy, but projectile composition and probably shape as well. One point in your favor: if the concave part of the fracture is inside, then the projectile arrived from outside: you didn’t break the window by whacking it with something. Yeah, I can definitively say that it was an exterior impact as long as they understand the basic mechanics of high velocity projectile strikes. Anyways, thank for the help, I have enjoyed the chat! I can attest that gravel thrown from a mower can crack a window. I was mowing the grass strip down the middle of our gravel driveway and heard the crunch, crack that indicated a new basement window pane was in order. It has been a while, but as I recall the damage was a diagonal crack with no through hole, presumably from a slower, heavier piece of gravel. There’s a definite difference in damage caused by a large slow object and a small fast object, even if they have about the same kinetic energy. It probably has something to do with the concentration of force and speed of crack propagation, but I admit to being completely out of my depth, even if I do take exaggerated care to avoid whacking the glass around here.